Recent Finds Raleigh Club Member Ads Show Calendar . 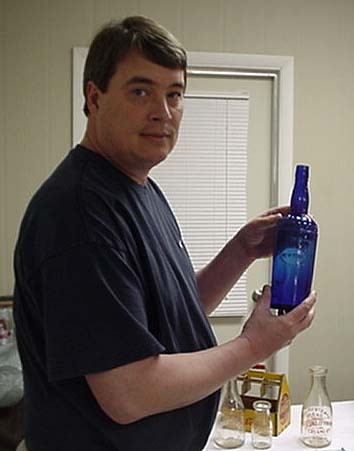 The Southeast Bottle Club is a non-profit organization serving the Southeastern United States. All meetings and events are open to the public, so drop by and check us out. We hope you'll consider joining the club. Club members receive the monthly newsletter via Email or postal mail, run free ads in this newsletter, and participate in all the fun and benefits the club has to offer. Free Email-only membership is also available - just request it. 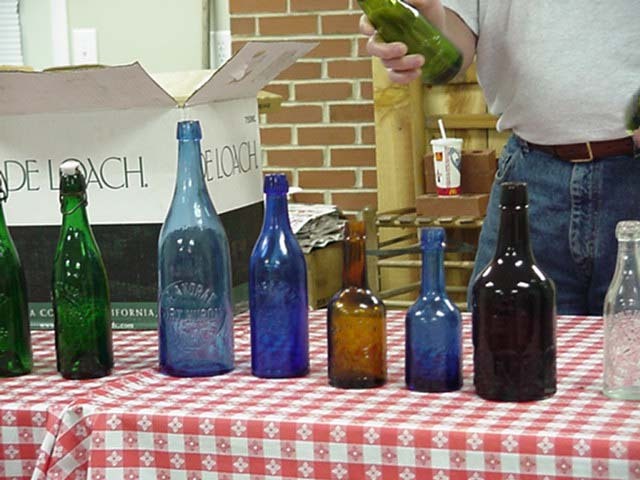 This newsletter is currently distributed to over 3,400 bottle collectors. Information within this newsletter may be reprinted as long as credit is given to the source. 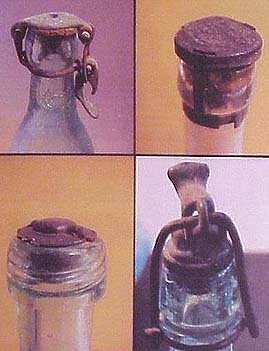 This month the book corner features David Graci's new book on "Soda and Beer Bottle Closures 1850 - 1910", which deals with the history of efforts to create the perfect bottle closure. Above right is a picture from one of the book's pages. 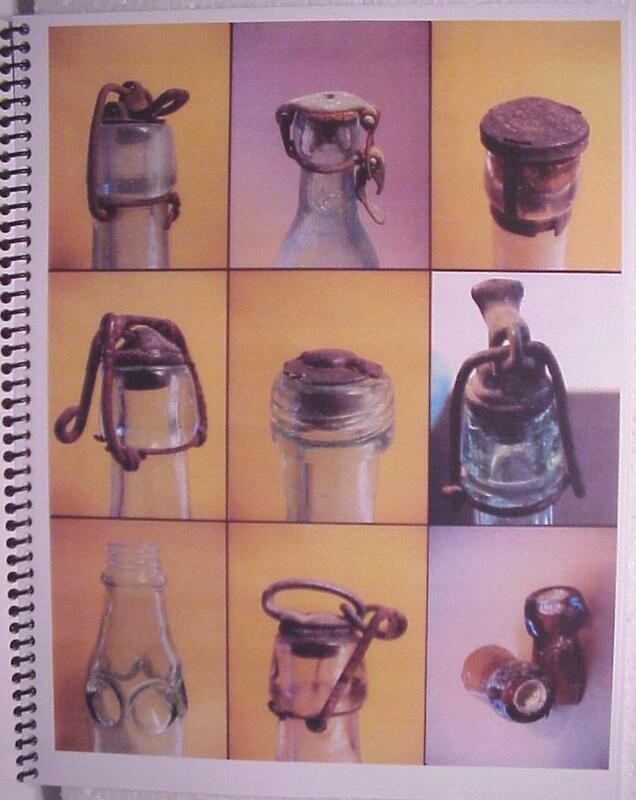 Soft cover, spiral bound, with over 90 pages detailing the development of bottle closures from 1850 to the Crown Cork. Over 100 color pictures plus numerous black & white and line drawings tell the facinating story including efforts by Henry W.Putnam, Albert Albertson, Hiram Codd, William Roorbach, Charles de Quillfeldt, Arthur Christin, Charles G.Hutchinson, Frederick B.Thatcher, Alfred L.Bernardin, William Beardsley and William Painter, plus many more, including 15 foreign examples. Here is the complete story found nowhere else. See eBay advertisement for this festival. 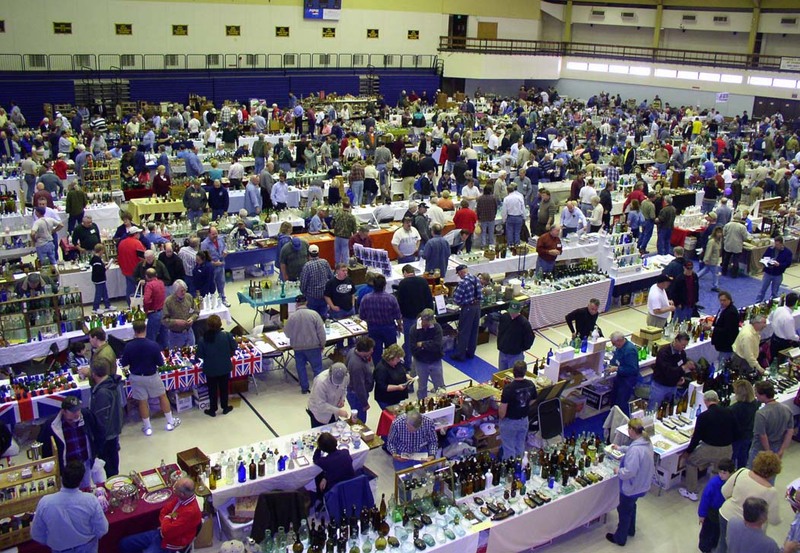 Saturday July 31, 2004 noon-2pm: Swap Meet, Raffle, and Presentation at Granddaddy's Antique Mall in Burlington, NC. 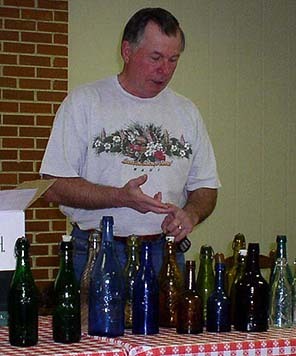 David Jackson will be doing the presentation on whiskey bottles, including his Casper's collection. 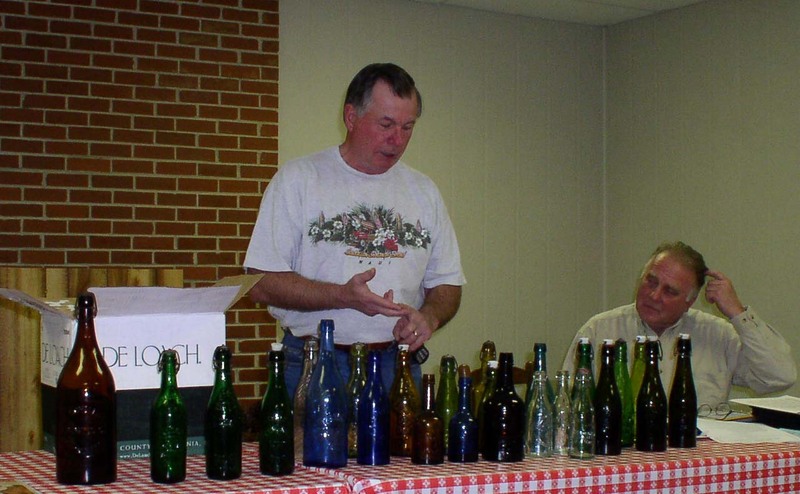 Like all Southeast Bottle Club events, this swap meet is open to the public, so members and non-members may attend. Everyone is encouraged to bring bottles for sell and trade - but please limit what you bring to what will fit in two boxes. Please bring a folding chair to help us with the seating. There will be a raffle with some great bottles. Free appraisals will be given, and there will be free bottles for kids. Some come join us for the fun. Directions: in Burlington NC take EXIT 145 at I-40/I-85, then north on Maple Ave about 1/4 mile. Grandaddy�s is on the right at 2316 Maple Ave. For a PowerPoint flyer on this event, click here. 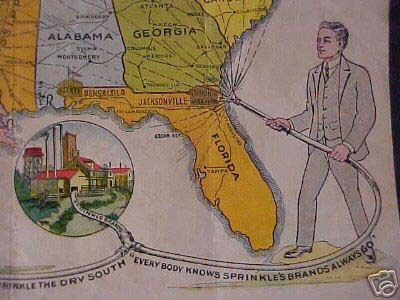 The Southeast Bottle Club does not require membership to receive its newsletter by Email or to attend any of its events. The newsletter is distributed free by Email to encourage more bottle collectors to participate in the events sponsored by the club and the other clubs in the Southeast region. 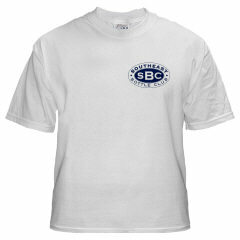 But paid membership is encouraged to help support the many activites sponsored by the club. So why not consider joining today? Click here for the online membership application, or for a printed copy just fill out the application on the inside of the back page of each newsletter. Remember that paid members can run free ads in this newsletter, and when you consider the newsletter is distributed to over 3,400 collectors, that's pretty cheap advertising for your bottle dollars. 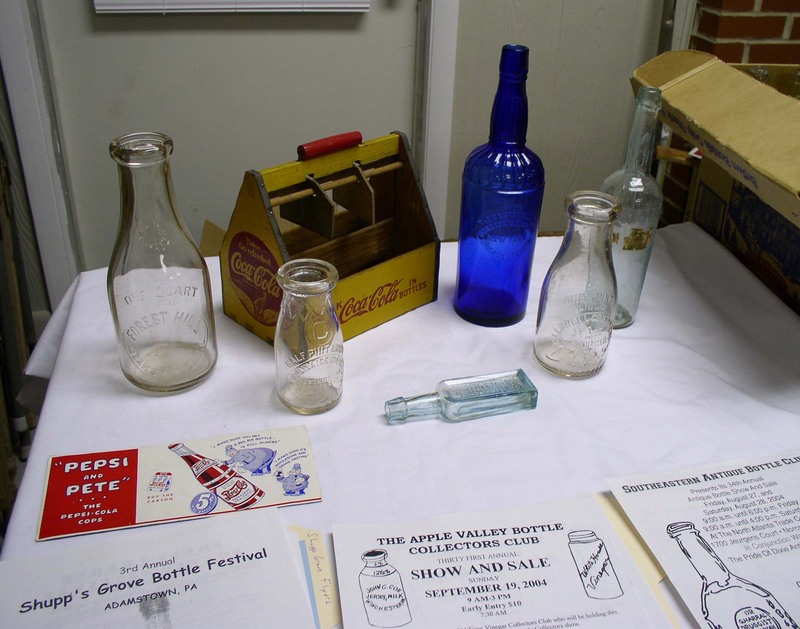 Thanks to these new members who recently paid dues to join the Southeast Bottle Club: Jere Hambleton - Lancaster PA.
and thanks to these collectors who recently renewed their membership: Howard Crowe - Gold Hill NC, Rick Humphreys - Memphis TN. Note: we've run into Email problems recently when attempting to send the newsletter to AOL subscribers. The problem is that AOL is rejecting our non-SPAM newsletter as SPAM. This problem is causing delays for AOL subscribers and is being investigated. 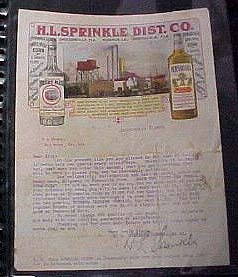 This section provides reports on any recent shows, auctions, or other events where bottles were sold. If you are going to a bottle show that Reggie plans to attend, please bring your show & tell bottles so he can photograph them and publish in this newsletter. If you attend a show in the Southeast and want your pictures/story shown here, then just submit and we'll publish them. 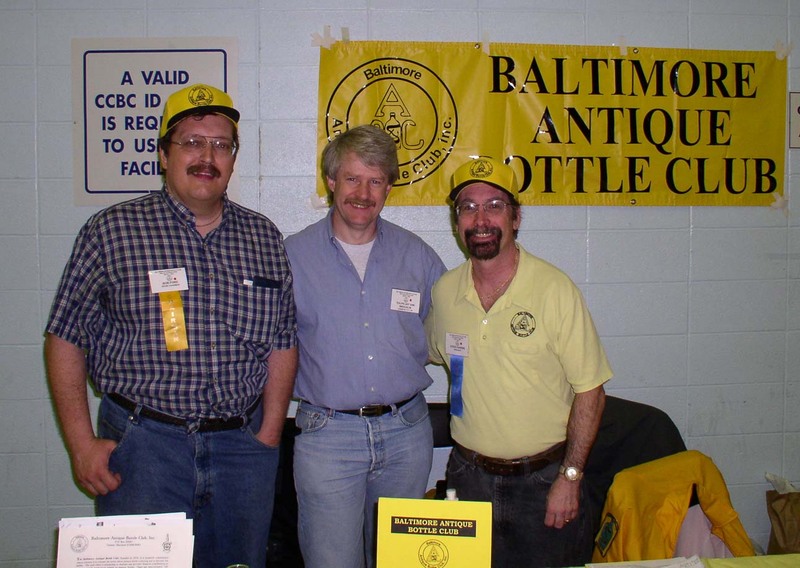 Show chairman Bob Ford, club president Steve Charing, and the rest of the Baltimore Bottle Club put on another stellar show that is the biggest single day show in the U.S. Paid attendance was around 1,404 people with all 310 dealer tables sold out and a waiting list for additional dealers. Quite a number of goodies walked in to the appraisal table, including an amethyst Washington flask. 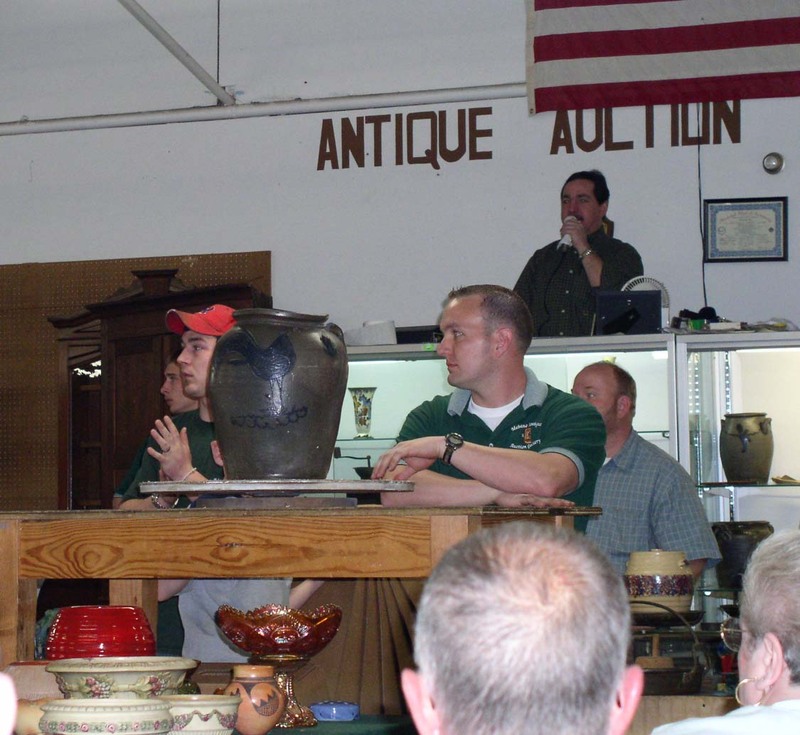 There was also a green Columbia-Eagle flask that received several $10,000+ offers that made its owner, a local lady, feel like she was on the Antiques Road Show. 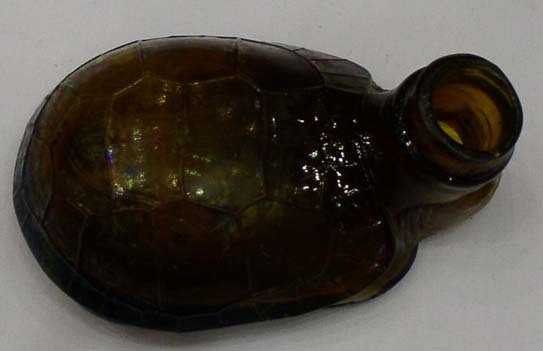 Collectors also walked in with a yellow JIEM ink and the amber turtle bottle shown below. There were many fine offerrings on the dealer tables. 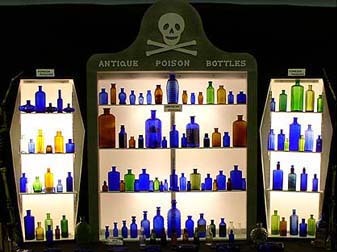 The APBCA (Antique Poison Bottle Collectors Club held a meeting at the show - here's a group picture. 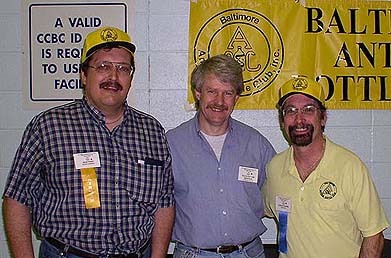 Show Chairman Bob Ford, Federation President Ralph Van Brocklin, and Baltimore President Steve Charing. 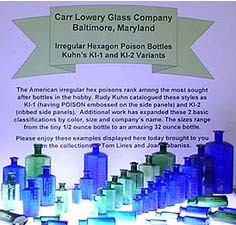 Tom Lines and Joan Cabaniss collaborated on this display of irregular hex poison bottles from Carr Lowery Glass Company of Baltimore. 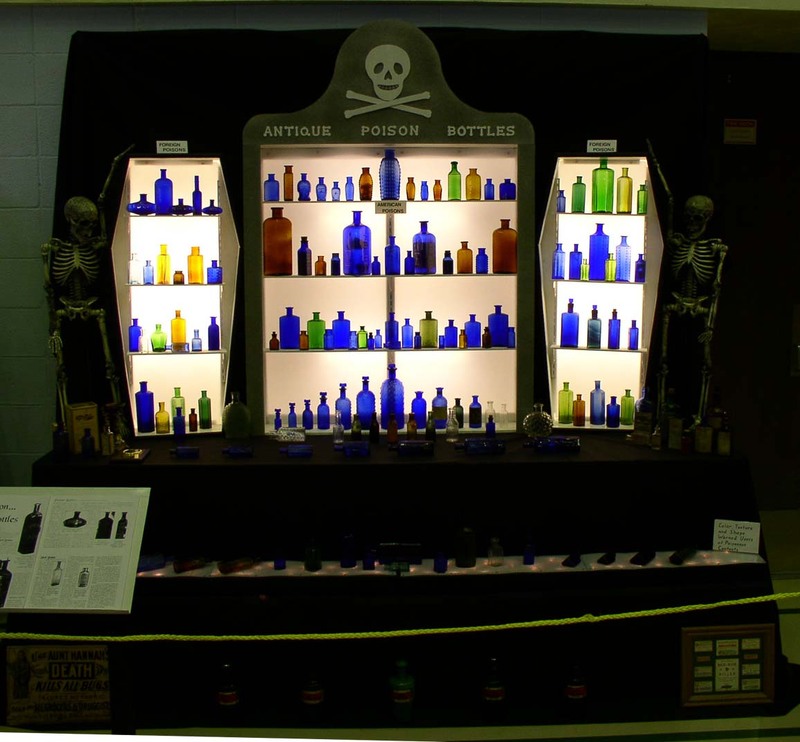 Poison Bottle display by Art Dell won Best in Show and People's Choice awards. Master ink bottle collector Ed Faulkner standing beside the biggest display ink we've ever seen: a clear CARTER'S owned by dealer Tom Salvatore. 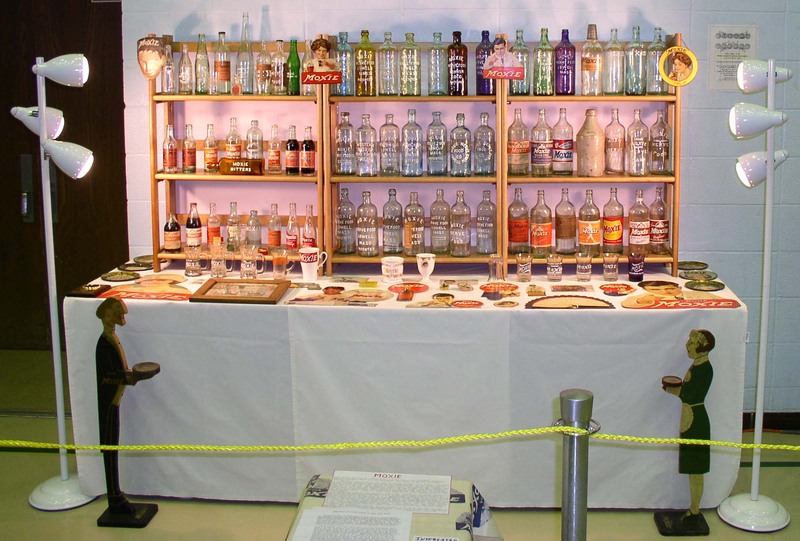 This impressive Moxie display by Dave and Carol Warris included the very rare MOXIE BITTERS bottle. Bird's eye view of the show floor Sunday morning around 10am. Heckuva' crowd. John Wolf brought this Farrar's / Ague Cure / Wilmington / N.C.M.Co. that was sold to a lucky collector. 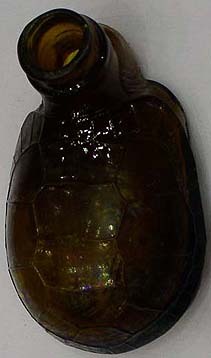 See rear side. 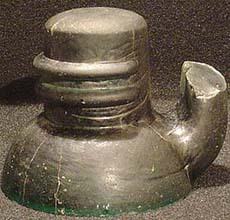 This is believed to be a Wilmington N.C. bottle, as examples were dug there. 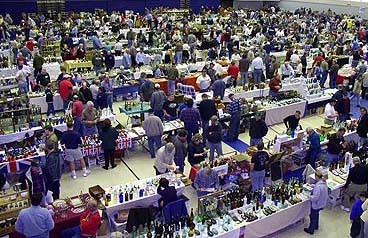 The Raleigh Bottle Club fourth annual show and sale was held on Saturday March 20, 2004 in the Holshouser Bldg. on the NC State Fairgrounds. With 224 in attendance, the show was busy throughout the day with good sales activity and much interest in the four displays. 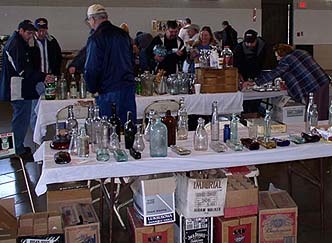 There were 43 dealer tables full of a variety of bottles and go with items. 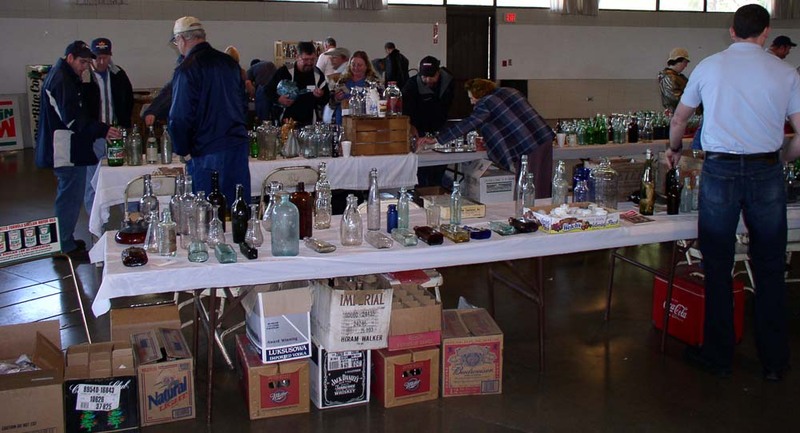 The weather was beautiful which made for a busy day at the flea market on the fairgrounds. First Place Winner Sterling Mann with an excellent display of Dr. Pepper items. 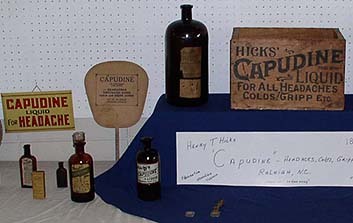 Second Place Winner Jack Murdock with a number of rare items from the Capudine Company and Henry T. Hicks Druggist. Third Place Winner Scott Berry with an outstanding display of decorated pottery. Thanks to show chairman David Tingen for the above write-up and another well done show. 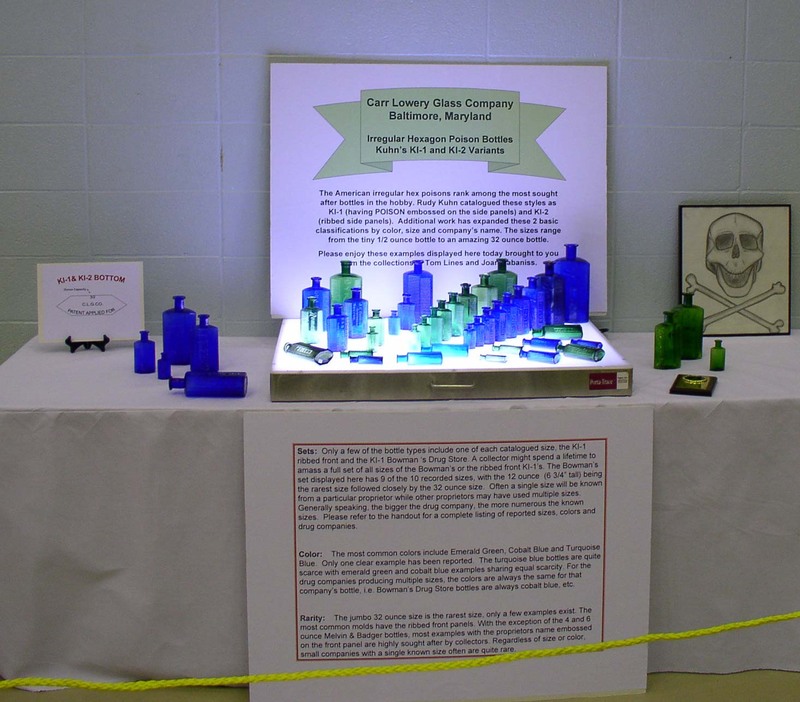 Below are some pictures from the show. To see all the pictures taken, click here. 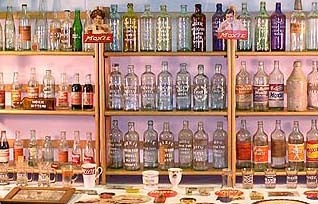 Jack Murdock displayed his collection of Hicks Capudine bottles and advertising. Hicks was based in Raleigh NC. 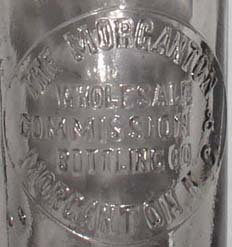 Darrell Conley showed this THE MORGANTON / WHOLESALE / COMMISSION & / BOTTLING CO. / MORGANTON, N.C. slug-plate crown-top soda from his collection. Scott Berry displayed this impressive collection of stoneware. 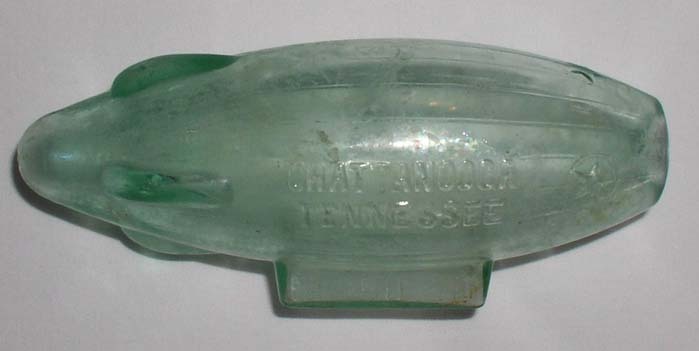 Scott Berry showed this recently dug bottle (missing its top) that was shaped like a Zeppelin and embossed CHATTANOOGA / TENNESSEE. Some of the buying traffic. 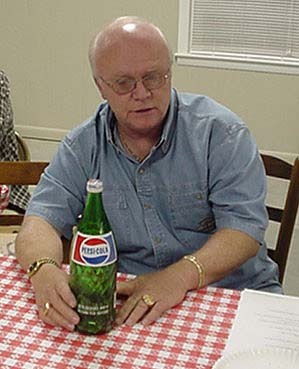 Chris Clark bought this rare onion-shaped Christo-Cola / WILMINGTON, N.C. bottle from dealer Paul Valenti, who is hosting the upcoming Lumberton NC show June 4-5. 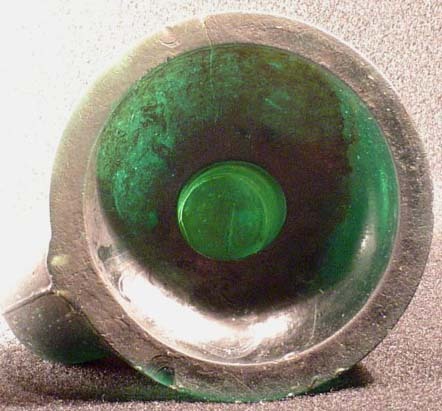 Green pontilled soda embossed W.H. 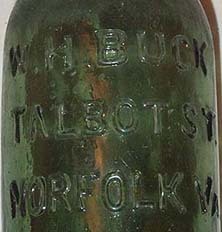 BUCK / TALBOT ST. /NORFOLK, VA. with tapered lip sold on eBay by stuffasfound for $837. This tiny 3 3/8" DR L.Q.C. 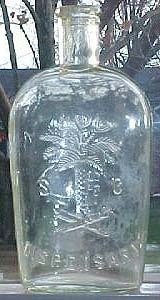 / WISHART'S / PINE TREE / PILE SALVE / PHILADA / PENNA U.S.A. / TRADE / MARK with picture of a pine tree sold by Glass Works for 1,400. Believed to be the only known example. 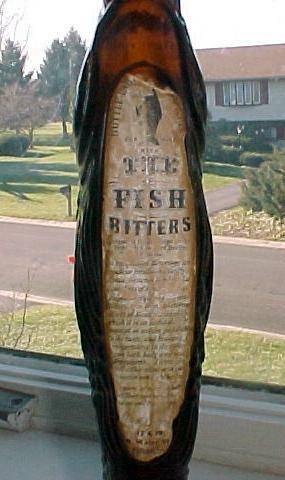 This honey amber figural The Fish Bitters / W.H. 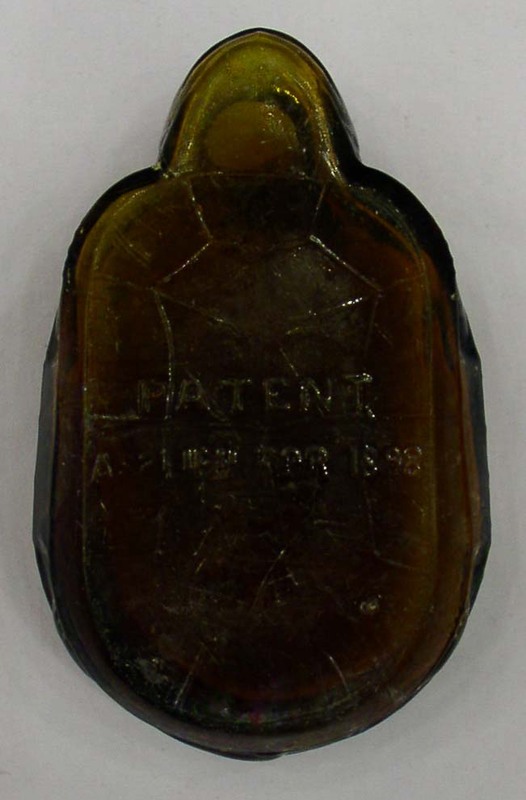 Ware Patented 1866 with original label sold on eBay by adaman for $560. 3 1/2" baby size "Teapot" insulator in dark green sold on eBay by sodanutt for $2,650 despite a few cracks. See base pic. 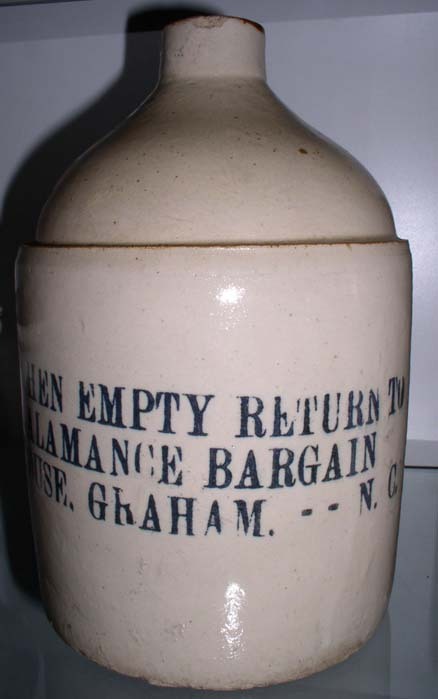 Rare style S.C. / DISPENSARY 7 1/2" union flask sold for $780 on eBay by chetbw. 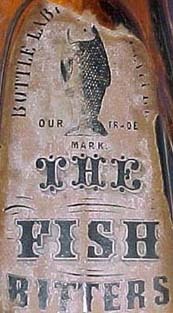 Rare clear Hutchinson soda embossed B.B. CO. / BARTOW / FLA. in circular slug plate sold on eBay by cqb9021 for $350. Neat color ad for H.L. 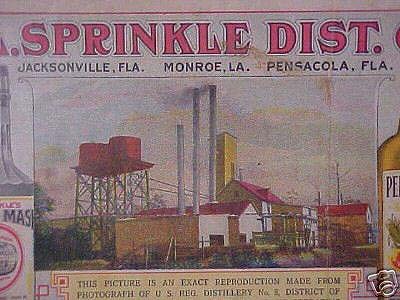 SPRINKLE DIST. 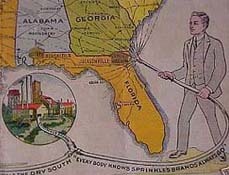 (DISTILLER'S) CO., JACKSONVILLE, FLA., MONROE, LA., PENSACOLA, FLA. showing man sprinkling the dry southern states with Sprinkle Whiskey. Sold on eBay by libertycurio for $64. 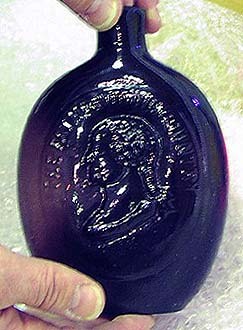 Dingen's Napoleon Cocktail Bitters with graphite pontil and original label sold on eBay by sidelinger8pkv for $8,600. 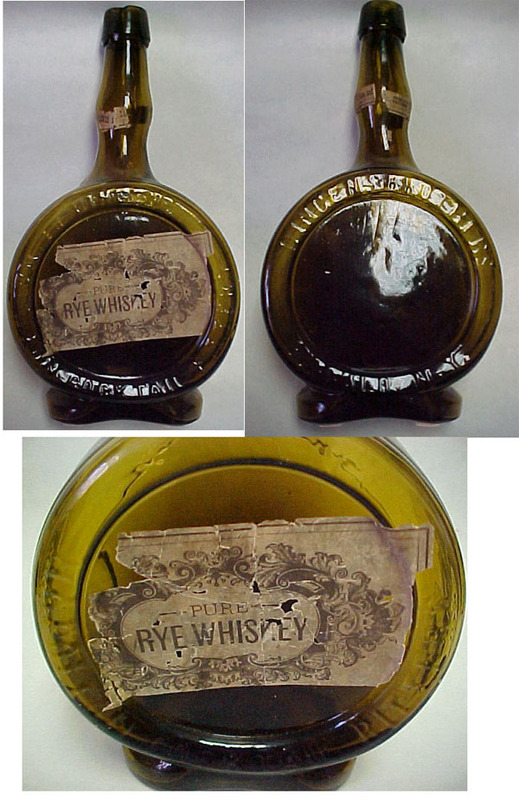 6 1/2" coffin style S.C. / DISPENSARY flask sold on eBay by rnr404 for $1,975. 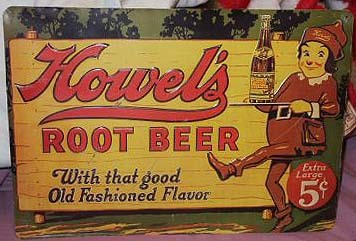 Rare tin sign for Howel's Root Beer sold on eBay by 14all-all41 for $481. 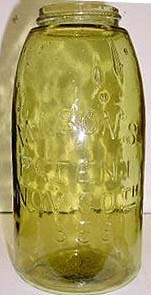 1/2 gallon Mason's Patent Nov. 30th 1858 fruit jar with WCD on base in deep citron color sold on eBay by tanr99 for $1,233. 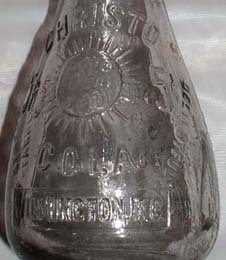 Seltzer bottle with etched label Coca-Cola / BOTTLING CO. / PARKERSBURG, W.VA. sold on eBay by seltzerkid for $511. 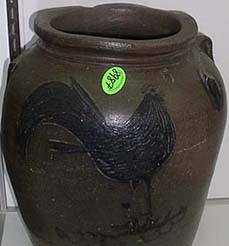 This amazing 1850s crock with incised rooster from Roanoke VA area sold by Mebane Antique Auction for $50,000. 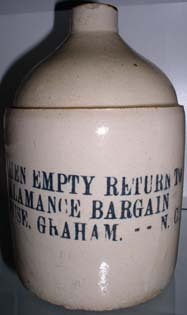 Gallon jug stencilled WHEN EMPTY RETURN TO / ALAMANCE BARGAIN / HOUSE - GRAHAM, N.C. sold by Mebane Antique Auction for $2,400. 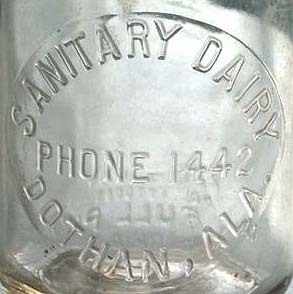 Round pint milk embossed in circular slug plate SANITARY DAIRY / PHONE 1442 / DOTHAN, ALA. and with a dent on backside that is embossed THIS SIDE UP above the dent and CREAM SEPARATOR BOTTLE INC. below the dent. Sold on eBay by honeymoonhill for $41. Note: the location of the club meetings recently changed from Clancy & Theys to the Glen Laurel Clubhouse at 4330 Galax Drive in Raleigh. David Tingen gave an interesting presentation on the various colors that blob top beers can be found in. Reggie Lynch showed this cobalt 4-cities Casper's Whiskey along with a few other goodies he had picked up recently. 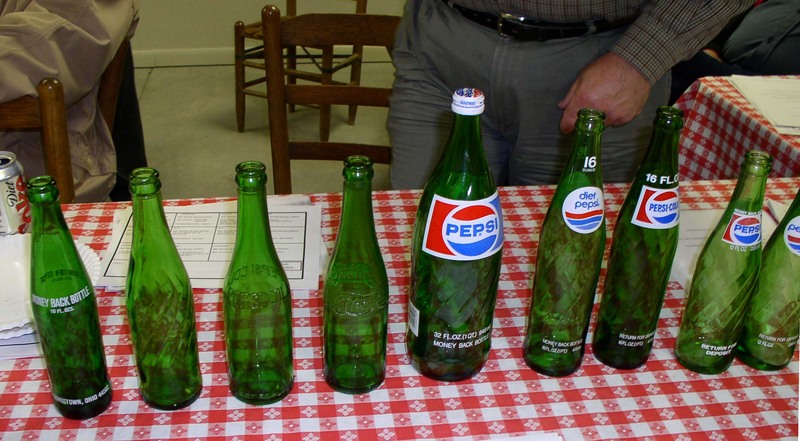 Donnie Medlin presented an array of Pepsi bottles, all in green colored glass. Bill Clark enjoying some of the snacks provided by the club. 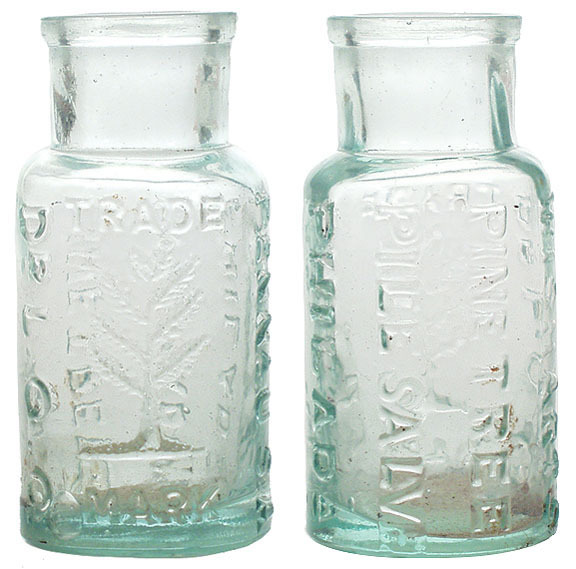 Wanted: MASON'S 1858 jars in odd colors. 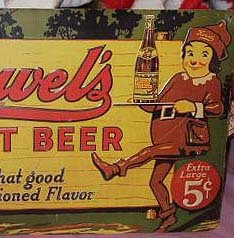 Wanted: bottles and advertising from Hamlet NC area. Also wants any old money and ephemera. 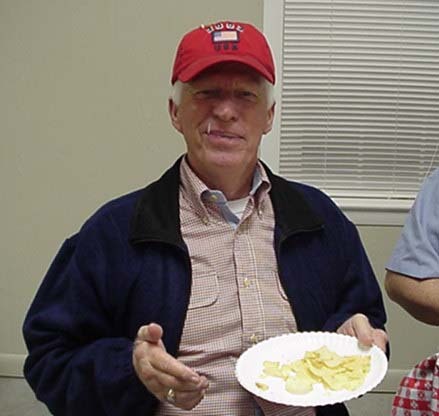 Vernon Vallance, 501 Lackey St, Hamlet, NC 28345, (910) 582-1608. 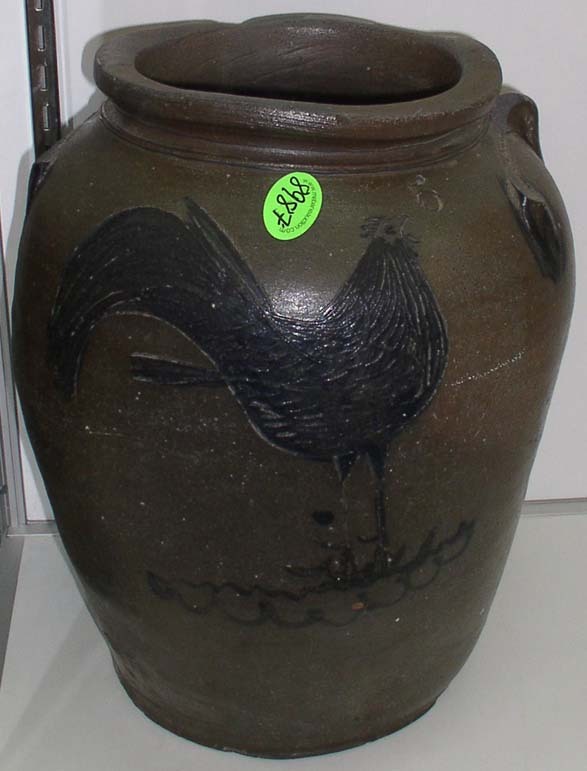 For Sale: Mason's CFJCo PATENT 1858 quart jar, cornflower, mint, RB #1920, $700, Perry Driver (386) 364-3203. 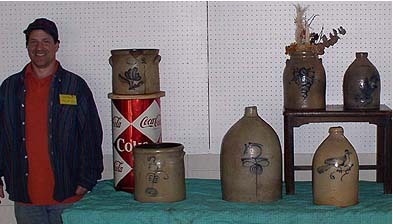 Want to buy or trade: NC advertising jugs (especially - "When Empty Return To:" stencil jugs), any state mini jugs / Saloon marked items, NC / GA embossed whiskey flasks and error fruit jars. 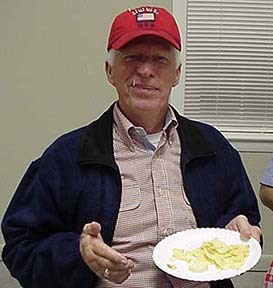 Bill Wrenn at (706) 769-8995, Email: ncjugs@charter.net. Note Bill's new Email address. 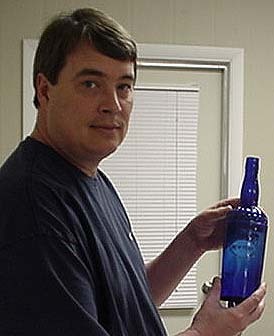 Wanted: Salisbury NC liquor jugs: P.W. Brown, George A. Jackson, Shumanca, and W.H. Hoover. Call Tommy Lyerly (704) 279-4291. Wanted: Mint Cola and Bob's Cola bottles. 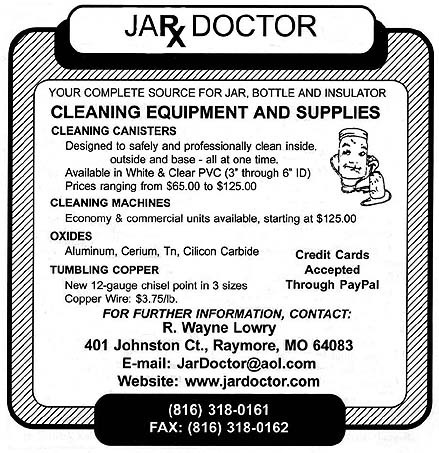 Carl Barnett, phone (912) 384-0651 after 6pm. Need help selling your bottles? I will consign your nicer bottles to get you top dollar. Also buying whole collections. 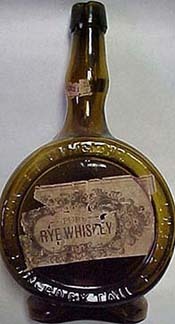 Reggie Lynch, Email: rlynch@antiquebottles.com, phone: (919) 789-4545. Check out my bottles for sale on the Internet www.antiquebottles.com/rl/ and in booth 615 at Granddaddy's Antique Mall in Burlington, N.C.
Liberty, NC Liberty Antique Festival has over 300 dealers. A few bottles can be found. From I-85 in Burlington, take the Hwy 49 exit and head south to Liberty. Then follow signs. Put on by Janmar Promotions, PO Box 939, Liberty, NC 27298. Call Vito or Mary Ellen Sico or Janet Hill at (336) 622-3040 or 622-3535. 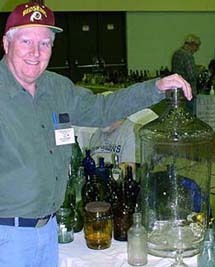 Montgomery, AL The Montgomery Bottle & Insulator Club 33rd Annual Show & Sale, 9am-4pm, early buyers Fri. 6- 9pm, at the Garrett Coliseum in the Ed Teaque Arena, Montgomery, AL. Info: JAMES HOPKINS, 2021 Merrily Dr., Montgomery, AL 36111, phone: (334) 288-7937, or BETTY BRADSHER, 7360 Heathermoore Loop, Montgomery, AL. 36117, phone: (334) 279-0072. 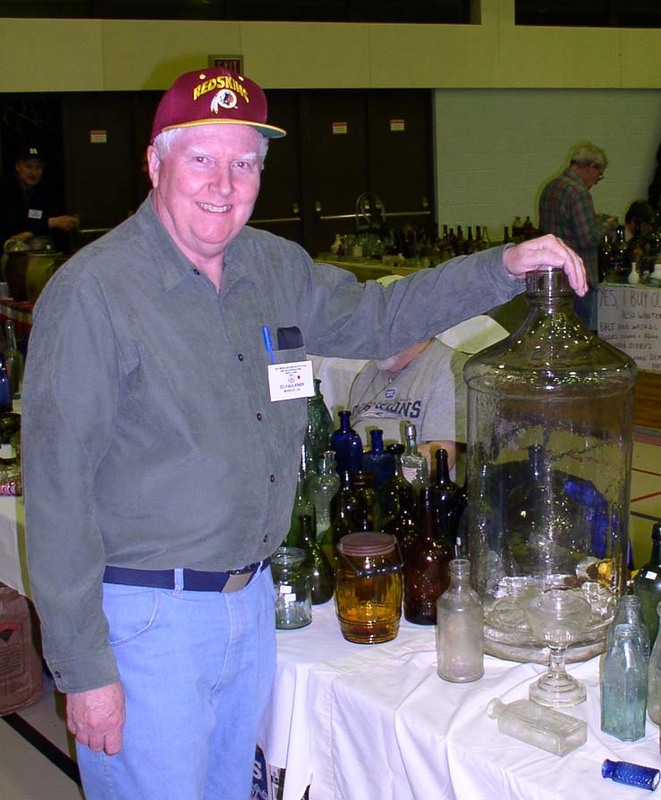 Lumberton, NC Antique Bottle & Collectible's Show & Sale sponsored by Robeson Antique Bottle Club. Free Admission Fri 3-9pm, Sat 9am-3pm. Dealer setup Fri 1pm. Location: The Expo and Farmer's Market, Exit 14 off I-95 in Lumberton, NC. 7,000 square foot air-conditioned convention building with excellent lighting & facilities. 100+ dealer tables.